I am about to do something radical. I am going to post this recipe without saying anything first; because I am as sure as I can be that you have eyes for only one thing: the recipe. Except it would be remiss of me not to mention how thankful I am that – after a wildly frustrating weekend making innumerable batches of these glorious, crackle-topped wonders – I finally got it right. The people that blind taste-tested these little dollops of almond joy raved. Then they clamoured for more – and for the recipe – for 3 days straight. If you were wondering how you were going to survive the holidays without heading into cookie *inSANEity – NOW YOU DON’T HAVE TO. What with these and the Dark Chocolate Espresso Cookies, you’re set. 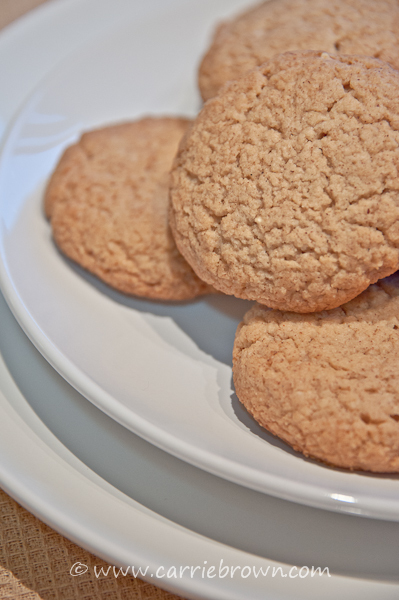 These dreamy almond cookies are slightly dense, moist, and chewy in the middle. They’re almondy enough to knock your socks off. At one point I thought the cookie dough was possessed. By the time I was on the 7th batch, I swear those cookies were trying to kill me. In the end though, *SANEity prevailed. HURRAH!! In a bowl, using a hand mixer, whisk together the eggs, butter, almond butter, xylitol, syrup and almond extract until it is light and fluffy – about 3 minutes. In a small bowl mix the almond flour, baking powder, salt, xanthan gum and chopped almonds together well. Add the dry ingredients to the egg mixture and gently stir until completely mixed but do not over mix. Wrap in plastic film and put in ‘fridge for at least 2 hours, or overnight. Remove from the ‘fridge and working quickly, roll into small balls (I used 1 oz per ball). Place balls on baking sheet and then press down with your fingers until they are 1/2″ thick / 2″ across. Brush with beaten egg to glaze. Place in center of oven at 350F. Bake for 12 mins or until lightly colored. Could it be 10 drops instead? StNding by and thank you again for all your help and insight. Jennifer - Hi Carrie. I am so thankful for you as our SANE baker and chef…I love cooking and appreciate that I can still do so using your recipes after going SANE. Can you address the cost of xylitol in your cookie recipes (almond & choc espresso)? I bought an 8oz jar of xylitol (Jarrow Xyli Pure) at my specialty grocery store, and it cost about $10. This makes baking cookies expensive, and one jar wasn’t even enough for the espresso cookie recipe in my recollection! Do you buy this in bulk? And where? Should I go to my local store for pastry chefs — or online? Is there a particular brand of xylitol you like and keep on hand in bulk? Cowgirl Rae - Hi Carrie, are you using the higher quality blanched almond flours like is recommended on the gluten free sites? OR are you using the more common almond meal/flours one can buy locally like Bob’s? I have read conflicting info about how they ‘work’ for various baked goods. I suppose a cookie would be different than a bread. Minna - Hi Carrie,I’ve been following your food blog and listening your podcasts for some time now. Thanks for great recipes! I definitely will try these cookies as soon as I have some time for baking. What could I substitute for the vanilla syrup and the almond extract as I don’t have these ingredients in my cupboard? If I just leave them out, will it not work? Jeanne - Carrie, how do these keep? Freezer or a sealed tin on the counter? I live alone and the thought of 32 cookies in the house is overwhelming. I might halve the batch.